I encountered an issue with the summary screen in battle. Hello. There's only a few bugs pertaining to some moves which bug out. No crash occurs, only an error message and the battle turn ends as normal. It happens when using Magic Coat when an enemy is going to use a stat-lowering move against you. Also, i'm unsure what exactly the Chatter scripts are for, but Chatter replicates a similar bug. Showing the move animation, then error message. Then the next turn starts. Do you want to show us the error messages you're getting? They contain information about the errors and are quite useful. From using Chatter. We ended up changing the move altogether. Yes. Here is the screenshot of the error log when using Magic Coat followed by the enemy using Growl. Another bug, this one is inexplicable and I can re-create it almost every time. the chat box text goes to the absolute smallest setting, making it completely illegible. But then resets on battle end. I don't know where to begin with this one, lol. EDIT: It seems like this was happening because in a double battle, if the trainer name has the '&' character it will result in an underscore when put into comment and script commands. This apparently somehow causes any simultaneous switch-ins on the same turn to resize the default text about as small as it seems possible. I don't know why, but it does. If you have two connected maps that both have fog you get some pretty funky effects from them overlapping as you transition between those maps. I have a really nasty fix where I change Game_Map to delay running autorun/parallel process events until the player is physically on the map, and also change MapFactory to immediately set the fog opacity to 0 when the player leaves the map, but I imagine there has to be a better solution? 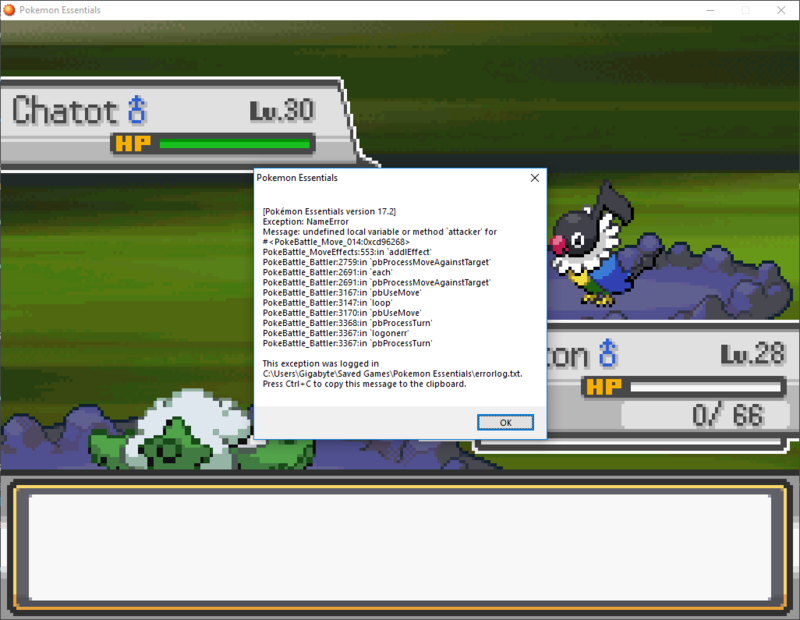 For some reason Pokemon Essentials decides to use MEs for pbTrainerBattle and all its related PBS data which will not deliver a loop due to the characteristic of an ME of playing just once. 1. Modify some segment of the code to play BGMs instead of MEs and memorize the map BGM to play it after the battle ends. Both approaches I tried however results in the trainer intro playing for about half a second after the battle ends before transitioning back to the map BGM. I don't think this behavior is intentional. I wanna say that Fire Fang has a 1% burn and 1% flinch chance. 142,FIREFANG,Fire Fang,00B,65,FIRE,Physical,95,15,10,00,0,abei,"The user bites with flame-cloaked fangs. It may also make the target flinch or leave it burned." Interestingly the same thing happens for Ice Fang, but not for Thunder Fang (which has 100 in the PBS). However even Thunder Fang doesn't work correctly with Serene Grace, because it generates a 10% chance without consulting the ability. EDIT: Nor does the "hold ctrl to generate the secondary effect in debug mode" thing work, for the same reason. I'm not sure if I should call it a "bug", but whenever you have an event following you and you tell them to stop following, they disappear from existence. You should at least be able to find them in the same spot where they were before without having to refresh the map. Oh, and don't even get me started with that annoying bounce you see whenever you transfer maps!